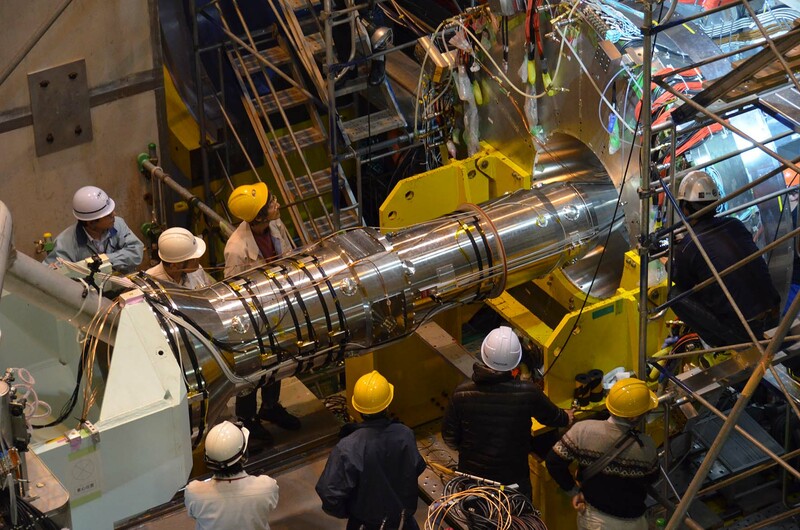 【Belle II Experiment】QCS Superconducting Magnets for Final Focusing of e-, e+ Beams Connected to Central Beam Pipes inside Belle II, Remote Vacuum Connection (RVC) Works Successfully. From 10th to 15th of January, 2018, at KEK Tsukuba campus, where the SuperKEKB accelerator and the Belle II detector are being prepared for the first collisions of electrons (e-) and positrons (e+), the QCS superconducting magnets for final focusing of the beams were moved to the core of Belle II detector from both forward and backward sides and connected to the central beam pipe by the Remote Vacuum Connection (RVC) system, proposed and developed by Deutsches Elektronen-Synchrotron (DESY), one of the important collaborators of the Belle II Experiment. 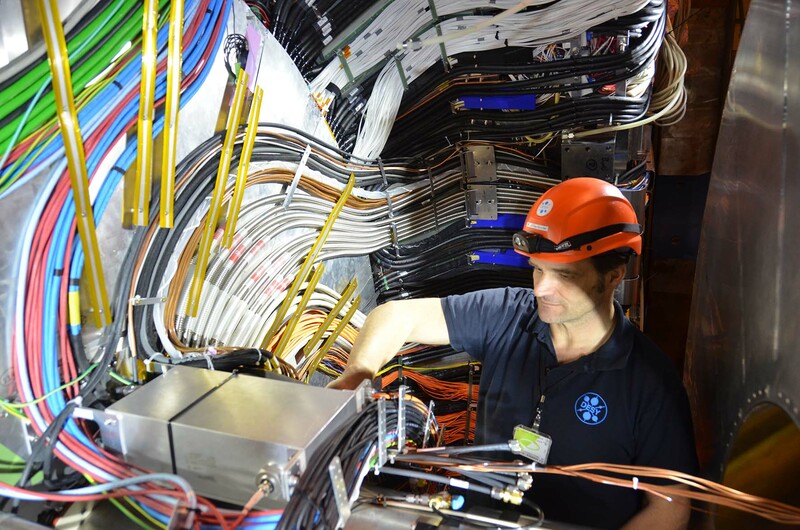 In the SuperKEKB accelerator, luminosity 40 times greater than in the KEKB accelerator will be achieved by employing the nano beam scheme; it makes e- and e+ beams to be focused to a beamspot of about 100nm in hight, which is 20 times smaller than that of KEKB. QCS superconducting final focus magnets are designed to squeeze beams and must be installed in the proximity to the VXD (Vertex Detector for measuring the decay position of the B-meson), at the core of Belle II detector. DESY chief engineer, Karsten Gadow watching how RVC works at the forward QCS connection to the central beam pipes. But the core of the Belle II detector is very tight and has too little space for hands to enter and tighten the flange bolts of e- and e+ beam pipes. Therefore, a novel Remote Vacuum Connection (RVC) was proposed by DESY engineers in 2012 and has been developed and improved at DESY research facility in Hamburg. RVC is state of the art technology that connects two beam pipes with small flanges by turning lock cylinder and activating pressure from outside. This way vacuum seals are compressed in a well-defined manner which guarantees the leak tightness. DESY is now applying for a patent for the technology. The first RVC operation began on 10th. Amongst 30 researchers and engineers from KEK and other institutions engaged in the operation, DESY chief engineer, Karsten Gadow who invented the technology, played the key role. 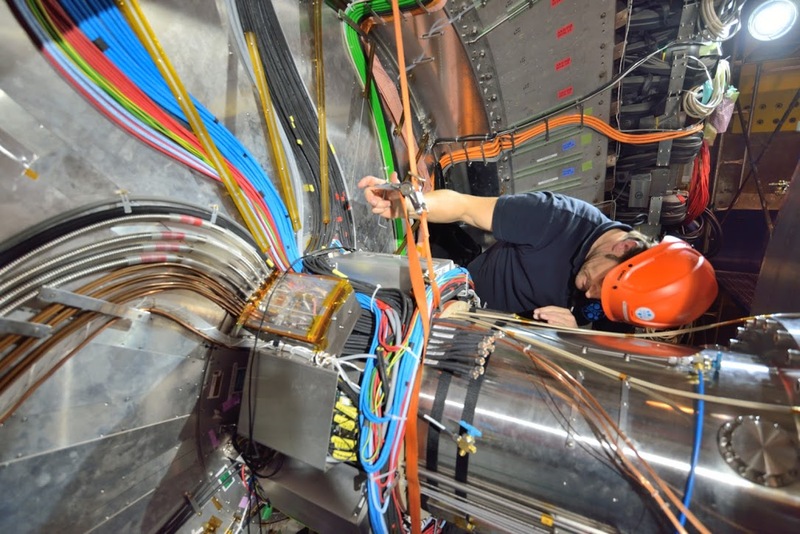 On the 10th the Forward and on the 15th the Backward QCS superconducting magnets were moved into the Belle II detector and finally beam pipes were connected by RVC system; this was possible after remaking and exchanging some parts which were in the way of QCS. Mr. Gadow recalling the operation beside the backward QCS. – I am surprised that you are the only person from DESY in this operation. Mr. Gadow　As for computer science or particle physics, other researchers would attend. But I am the only one in DESY who knows RVC technology. – Who in DESY did get the idea of RVC? Mr. Gadow　It was my idea. Vacuum connection is needed at the core of Belle II detector, which is very tight and has little space for hands to enter and tighten the flange bolts. I proposed and designed a prototype at DESY research facility in Hamburg. – Did you get hints for it from anywhere? Mr. Gadow　I love the space missions and the technique to connect space shuttles inside the space vacuum. I got some inspiration from these technologies. – May I have a brief explanation for the RVC system? Mr. Gadow　RVC is state of the art technology that connect two central beam pipes with small flanges by turning lock cylinder and activating pressure from outside. In the lock mechanism test in DESY, after fixing lock nut flange, position changed less than 80μm when pressure was released, which is much less than required deformation of Helicoflex seal: 900μm. I changed pressure supply from oil to nitrogen gas in order to avoid possible oil leakage and hardening. Technology transfer office at DESY is now applying for a patent for the technology. – What is your impression on the task of closing RVC? Mr. Gadow　It was good for our first operation, though there were many people on the B4 floor and I thought it was too crowded. – What has been the most challenging work or task in this operation? Mr. Gadow　Connection itself is very easy. Connect beam pipe flanges, activate pressure by nitrogen gas and press the seals, it takes only 10 minutes. But some parts were in the way of QCS and we had to remake and replace them. In case of forward QCS, a TPC detector attached on the CDC was too close to the QCS and I remade and replaced mounting brackets for it. In case of backward QCS, I remade and replaced guide parts for cooling water lines for the bellow pipes. I said in advance that we need 2 weeks for closing RVC. It took a certain time as I expected. – What are you going to do next? Mr. Gadow　All I had to do has been done and I am relieved of pressure. I am going back to Germany on Friday (Jan.19). In DESY, PXD assembling job for phase 3 run of SuperKEKB is waiting for me. PXD is to be packed, transported to KEK and combined with SVD into VXD. VXD is going to be installed in the center of Belle II this summer after phase II commissioning in exchange for the BEAST II detectors. Then, I have to come here to operate the RVC. – What is your hobby? And what would you like to do in the weekend? Mr. Gadow　My hobby is Triathlon (swimming, cycling, running) and to work in my garden. If I have all done this I like to go with my two daughters to coffee bars and into the cinema. – Thank you very much for your corporation. KEK's IPNS (Institute for Particle and Nuclear Studies) is a national institute for particle and nuclear physics in Japan. We carry out comprehensive studies on particle physics, nuclear physics, and astrophysics using both theoretical and experimantal approaches. Institute of Particle and Nuclear Studies.